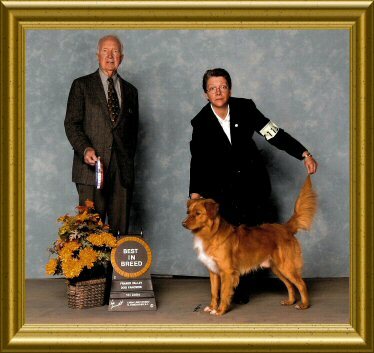 My partner and I purchased our first Nova Scotia Duck Tolling Retriever in June of 2003 from ReadyFor Kennels. Ready for Adventure “Kia” joined our household primarily as a pet, although we did commit to looking into confirmation and agility competitions at the time of purchase. 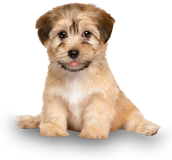 When asked about possible dog training services, our breeder suggested Sit Happens as she had used them with her 3 dogs, and several of her puppy owners had also used their services with great results. We tried a few puppy classes offered by various trainers, and quickly discovered that food only works when you have food in your hands, clickers don’t work from a distance, and choke chains or restraints are just not our speed. We contacted Jeff in early September for our first session. The results were immediate. Sit and Down became useful tools during grooming. As did In and Out whether you pointed to the kiddie pool or the tub. Out also meant leaving a room, which is handy when you are trying to cook dinner or really don’t want company in the bathroom. Shake ensured “dog shakes” happened outside or behind the closed shower curtain. Off eliminated the couch wars. Leave it eliminated all fear of shoes being destroyed or accidental damage to anything that is not a dog toy. Place ensured our guests could sit down without a furry paper weight on their lap. 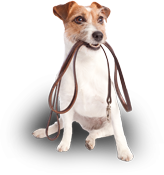 Come, Heal, Bring and Give make our daily dog walks enjoyable for all as we can get to the trail without any strain on the leash, and then enjoy a great game of fetch. Find makes for a great game of hide and seek. Kennel made bed time easy has he knew to head for bed (most likely exhausted from all of the playing as everyone wants to play with a dog that has acceptable social behaviour). 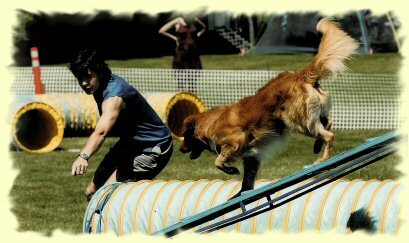 Kia quickly became a family member who knew his boundaries, and our thoughts soon turned to how we could use the system in training him for confirmation and agility competitions. 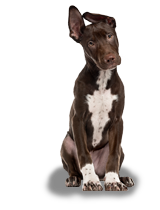 The Sit Happens training doesn’t only stop at training your dog to be a good companion. Kia knows how to Stand on command which is great in the Confirmation ring. He learned how to Hold any object in his mouth, Give the object directly to my hand, and Finish any retrieval or task by sitting next to me on the left side (and yes, it can be combined with the Hold command). Sit Happens success can be best measured by Kia’s success in the agility ring. He’s learned Jump, Weave, Tunnel, Scramble, Walk it, Teeter, Get Out, Chute, and Here with the hand dropped to the side you want it on. Kia is now 5 years old. He is more than simply our family pet; he is part of our daily lives. He’s travelled on vacation with us to Newfoundland, Alaska and the Grand Canyon. Everywhere we go, people are amazed at how well behaved he is. He travelled daily with me to work at SFU for the last 5 years. I never had to worry about where he was or what he was doing. In fact, our staff looked forward to seeing him every day, with some begging to have him spend the day with them in their office. Now that’s the measure of a well behaved dog!! He has received his CKC Championship (Confirmation), CKC Canine Good Neighbour Certificate, and his Bronze Award in AAC Agility. A large portion of our success is due to Sit Happens as competition success cannot be reached without good obedience training. 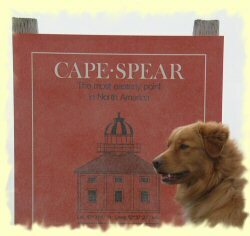 Thank you Sit Happens for your assistance in training more than a Champion, we trained a great companion!